Electronics City has geared up for a new Microbrewery in its vicinity in the form of 46 Ounces from the house of The Oterra Hotel. The Microbrewery currently has 4 brews in making - ranging from light to medium & strong flavoured craft beers. Koisch - A newly launched beer which is light in nature and best suited for amateurs to enjoy the afternoons. Hefeweizen - A slight stronger taste but yet goes well with the food! India Pale Ale - A brew with a bitter taste and goes well with sweeter food as the combination. Juicy Ale - My personal favourite among the 4; a well-balanced taste and goes well with all kinds of food. I tried their ram ladoo chat - their own version of chatpata chat made from ram ladoo which tasted like dahi balle! Paneer Tikka Pizza with Mushrooms - thin crust made pizza, amazing taste with the right amount of wood-fired process to create the best combination of taste & texture. 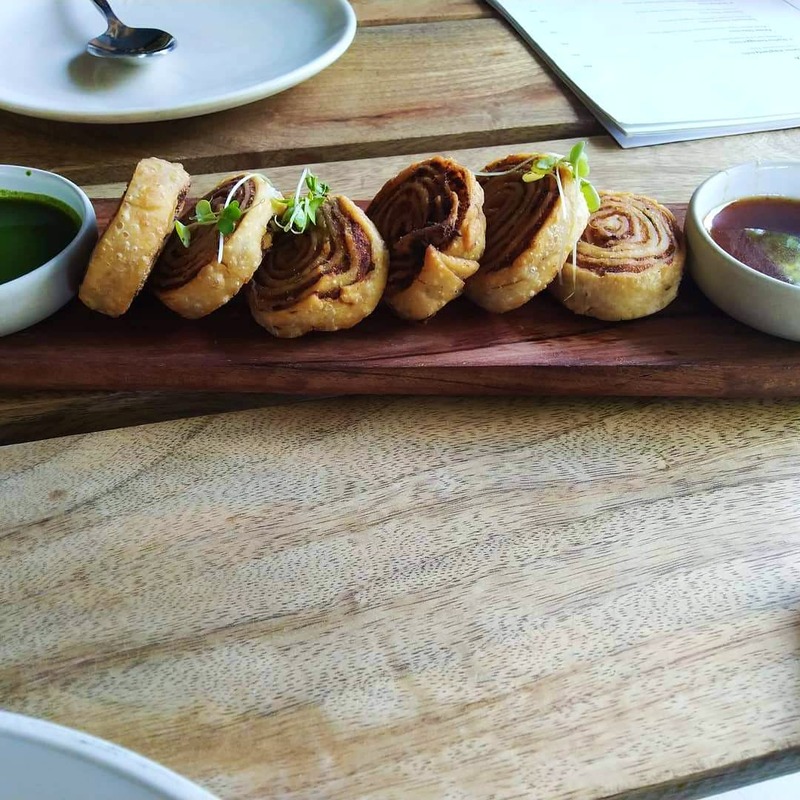 Bhakarwadi Roll Dry - a twist to the traditional swirl samosa in the form of Bhakarwadi, great tasting food that went well with sweet and green chutney. Cheese Toast - a humble cheese toast made in right texture that just melts the cheese to create a magical taste and mayo to partner it. The menu is designed by renowned chef Suvaranjan Banerjee and prepared by executive chef Alok!! This space will never disappoint you and lots of surprises are awaiting the customers in terms of food & craft beer!! Happy crafting brews!